I purchased at Home Depot the Yard Machine 21 inch 2-in-1 push mower. I made this purchase last summer and used it all summer. I have had other more expensive mowers and this one definitely holds its weight against the competition and at a more affordable price. When the grass is really high (because I didn't get time to mow it) I will use the catch bag. I don't have a very large yard and the bag fills up quickly, but I will much rather dump a bag of grass then rake a yard full of grass any day! But if you keep up with your lawn on a weekly or twice a week mow, then the mulching setting will work just fine and I have used that many times. This particular model doesn't have that auto drive function, which I would prefer but its not so heavy that I cant push it. Plus I need the exercise! It starts up no problem! I used it for the first time this year and after sitting all winter, it started up no problem first pull! My son can start it and he is 9. 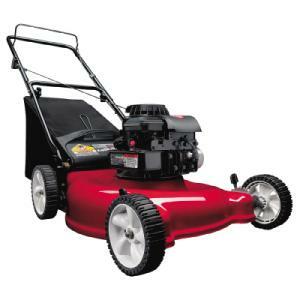 I would recommend this mower to anyone looking for a good cost efficient lawn mower. It doesn't have all the bells and whistles that more expensive mowers have but I feel it was more then worth the price of under $200. I just bought this mower over the weekend. I purchased the model with oversized rear wheels. So far, so good. Extremely easy to assemble. Basically you just have to unfold the handle bar, add oil & gas, and you're off. I'm not overly impressed with the apparent quality, but we'll see as time goes on. I did purchased the extended warranty for an extra $20.00, or so. It started with the first pull, so I was happy with that. We have had more trouble with this lawn mower than any other outdoor product we own. I have dealt with three authorized dealers who all say these machines are junk. The engine oil started leaking during the first use. I had it fixed, and after I used it again, it started leaking. I sent it to yet another dealer, same problem it still leaks. I am now AGAIN without a lawnmower because it is out being serviced. I will not only never buy this particular product again, I will never ever buy anything made by this manufacturer.